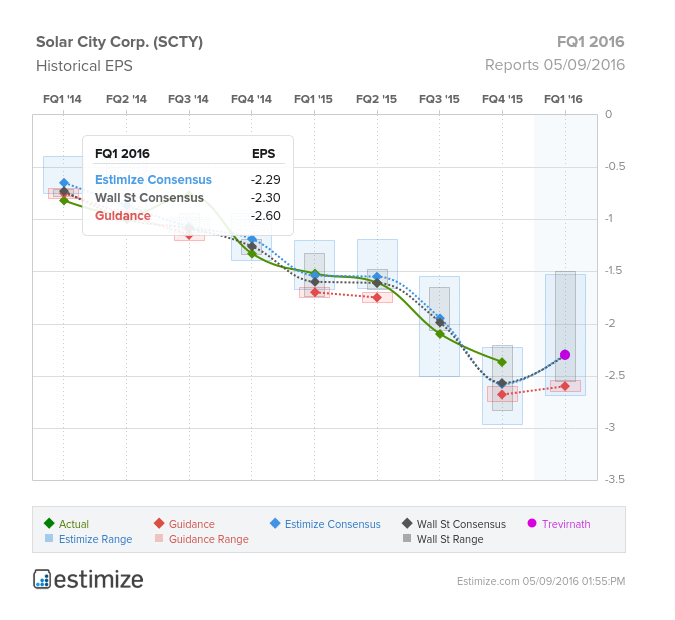 SolarCity: Is The End Nearing For The Industry And SCTY? Is the End Near for the SolarCity And The Industry? After Tesla met expectations this past week, investors are hoping Elon Musk’s other company, SolarCity can do the same when it reports first quarter earnings this monday. SolarCity may have received more good news earlier this earnings season when competitor First Solar beat expectations, reflecting increasing demand within the industry. Unfortunately SolarCity is not First Solar, and the Elon Musk run company continues to take a loss. Last quarter featured a beat on both the top and bottom line while losses reached record lows and revenue hit record highs. The Estimize consensus is calling for a loss of $2.29 per share on $107.21 million in revenue, 1 cent higher than Wall Street on the bottom line and $2 million on the top. Compared to a year earlier profits are predicted to fall 50% while sales could rise as much as 58%. 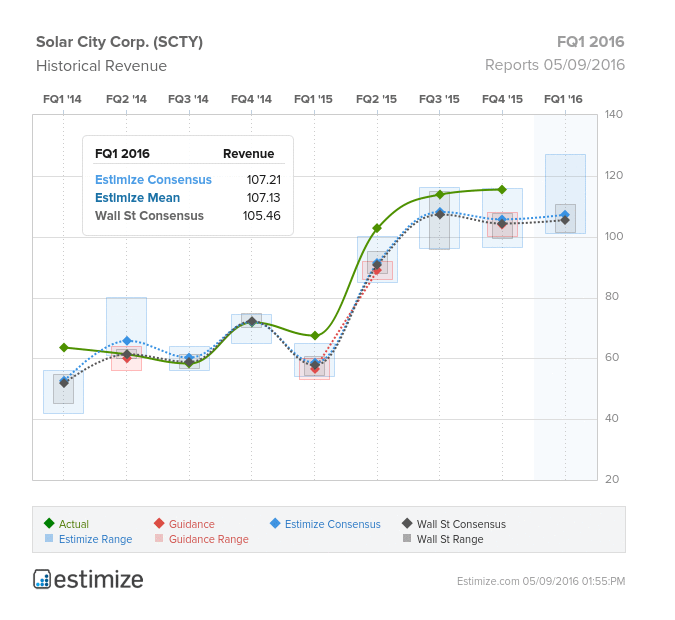 Given Solar City’s track record of losses, it’s not surprising that the stock is a frequent mover throughout earnings season. In the 30 days leading up to its report the stock increases as much as 8% and then declines to a 4% loss in the 30 days following its report. Solar City’s biggest problem lately has been its inability to generate profits. Each quarter earnings have steadily declined as the company continues to burn cash. This issue is unlikely to get better anytime soon as the price of solar energy falls and subsidies lessens. In an effort to not run out of cash, the company recently raised $227 million in cash equity from John Hancock Financial. While this is the great step in the right direction SolarCity will have to do more to manage its losses. Luckily as costs decline for solar energy, the company is seeing higher deployments. Last quarter featured record highs in solar megawatts installed and deployed with cost per watt declining. As the number of installations increase, the company will start to see improving future cash flow. Last month, SolarCity announced a deal to install solar panel systems in Whole Foods across the United States. The deal will be helpful this quarter that the company is guiding to be seasonally weak.